Ozil has been regularly warming the substitutes' bench for the Gunners this year and he has made the single league start in the 2-1 triumph over Cardiff City. According to BBC Sport, Emery does not believe the German has the credentials to meet his tactical demands and this has contributed to the midfielder finding himself out of the starting 11. 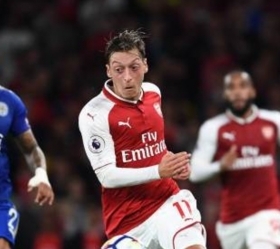 It is added that the move could eventually force Ozil out of the north London club with Emery likely to use the funds recouped to enhance the summer transfer business. Ozil was an unused substitute during the Gunners recent 3-1 league defeat at Manchester City but he could feature in the current weekend with a trip to bottom side Huddersfield Town scheduled. Arsenal are currently three points behind Chelsea in the race for the final Champions League qualification spot and they can't afford dropping any points against the Terriers.